DOMESTIC feed-sector demand for wheat and barley now growing in Victoria and southern NSW has strengthened in the past week as warm days, a lack of rain and yet more frosts batter prospects for struggling crops in southern Queensland and central and northern NSW. Crop conditions on the outer slopes and plains of southern NSW are also deteriorating. Traders said harvest pressure was becoming increasingly unlikely to impact on the price of grain from Victoria and those parts of southern NSW where crops were generally in good shape. Lachstock manager analytics and risk management products, Lachlan Hume, said the north’s feedgrain deficit, coupled with export demand, was likely to keep harvest pressure on southern prices to a minimum. “I think NSW is unlikely to see harvest pressure because the volume of the harvest will be limited, and I think the harvest pressure we saw last year was on account of growers having better than expected yields, and having to sell to make space,” Mr Hume said. Mr Hume said the impact on price and availability caused by the northern feed grain vacuum could not be overestimated, and southern end-users should not be lulled into a false sense of security about 2017/18 feed grain supply by the health of Victoria’s crop. Mr Hume said the size of Australia’s 2016 harvest saw sell-side pressure push the ASW price down by $30 per tonne. Beef feedlots, predominantly located in northern NSW and southern Queensland, are Australia’s major users of feed barley, and can expect to source minimal tonnages from their own regions due to reduced plantings and failed crops. Trade sources have said barley therefore had the potential to trade at a premium over APW wheat this year. “This could be the year in which we see barley trade over APW; October-November-December is fairly bullish,” one trader said. He said export demand for new-crop barley was also significant. Croker Grains general manager, Damian Moloney, said he thought deteriorating crop prospects from central NSW north would see the domestic market absorb a large amount of grain from southern states, and southern NSW. “I think there will be opportunities to sell into that market that weren’t there last year for sure,” Mr Moloney said. The flipside is that crops in parts of Victoria including the Wimmera are reported to be on track to yield as well as or better than the bumper crops harvested in 2016. However, Mr Moloney said they could still be hit by frost, and would need a kind finish to enable them to realise their yield potential. Mr Moloney said old-crop barley supplies were very tight, but old-crop ASW was still trading, with indicative prices at $275/t Port Kembla and $258/t for Geelong and Melbourne. This compared with a new-crop Melbourne delivered price of $266-$270/t which was attracting minimal interest from growers. Some wheat and barley crops which were in good shape one month ago now appear to be in danger of losing up to 20 or even 30 per cent of their yield. 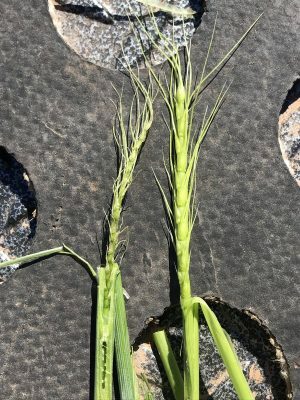 The northern Riverina is said to have been particularly hard hit, but agronomists said it would take a week or so until the extent of the most recent frost was known. Landmark Ariah Park agronomist, Jamie Pursehouse, said some low-lying areas of paddocks might have incurred total crop losses due to frost, whereas losses on higher ground could be limited to 20-30pc. Mr Pursehouse said some growers were opting to let stock in on failing cereals to get some grazing value out of them, but most crops looked like they would yield some commercial tonnage.